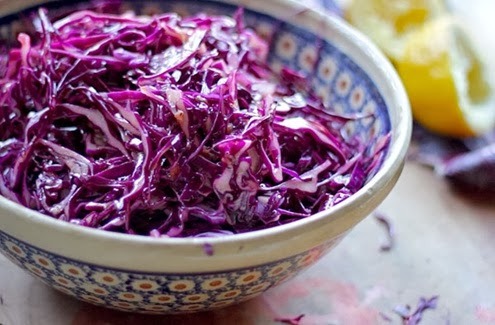 I LOVE red cabbage kraut. I am reminded of the time a young mother stopped me during CSA distribution. She had never seen red cabbage before. I told her it was just like yellow cabbage except it had better flavor, and gave her one with the suggestion to try it in place of lettuce. A year later, she came back and said she was still adding cabbage in place of lettuce. Mmm...I miss the ruby kraut at Angelica Kitchen. i should try making my own. Thanks for the inspiring reminder. Also, what a great story!